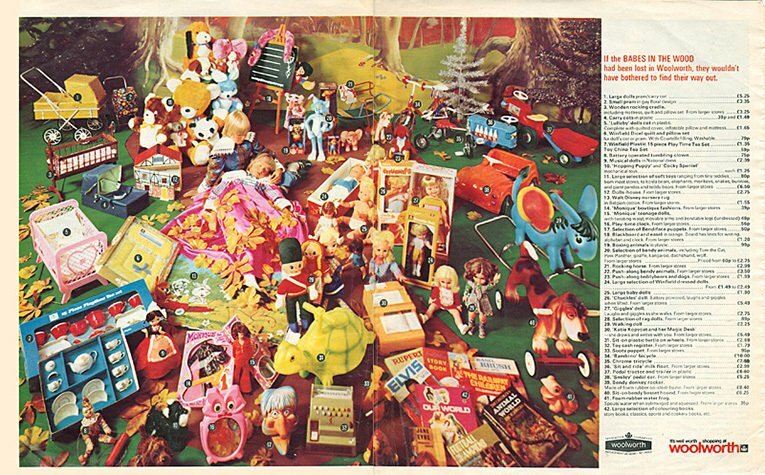 Kids tastes in toys and games changed a lot in the 1960s and 1970s. The baby boomers were the first generation to grow up with television, and were strongly influenced by what they saw. Some brands grew much larger by targeting their advertising and creating pester-power to boost their sales, at a time when household incomes were rising. Many manufacturers also looked to drive down their costs by moving their manufacturing base overseas, particularly as labour costs started to rise and as electronic toys became more fashionable and Far East factories were quicker to tool up to create solid-state circuit boards cheaply and reliably. 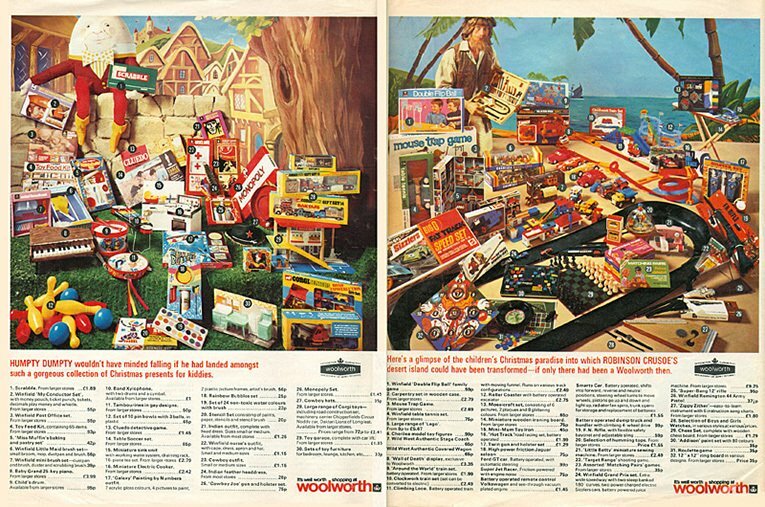 At Woolworth's the era was marked by brighter colours, bolder styles and an ever-increasing selection of toys to suit all budgets, including own label lines at prices that were hard to beat. On this page we look at some of the toys and games that amused our parents and grandparents in the days before home computers, on-line gaming and social media. On this page we take a look at some of the toys that our parents played with in the 1960s and 1970s. During the period Woolworth lowered its prices in response to strong competition. 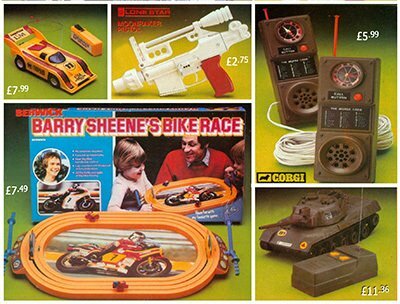 During the Sixties the toy range was given a major overhaul. Lots of new items were added, though by today's standard most of these look quite tame. Very few things needed batteries, let alone a mains adaptor. Woolworth stuck with its tried and tested personal service formula as its rivals adopted self-service. This left most of the branches looking old-fashioned. Most of the photographs on this page were taken for publicity purposes and show the company at its most modern. A number of Sixties toys celebrated the space programme. These are covered in a separate feature. The Government's decision to decimalise the currency forced the High Street chain to modernise. 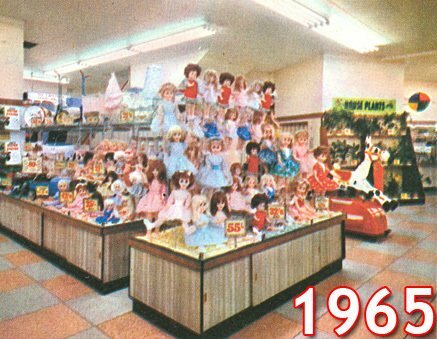 Between 1969 and 1975 most of the stores were given a new look. 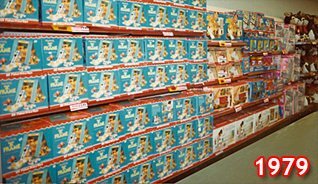 The period also saw the arrival of new ranges of battery-operated and electronic toys, which were sold at discounted prices and were heavily advertised on TV. In 1965 the Woolies store in Gallowtree Gate, Leicester was chosen to test out a new "futuristic" look. It had new ranges and new styles of display, with taller counters, but continued to have a till at each one, and to offer personal service to every shopper. The upgrade heralded a further move up-market. 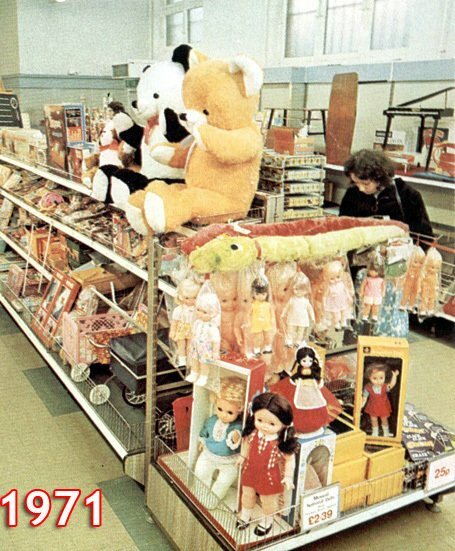 Many of the new items were at higher prices, like the dolls in the foreground of the photo. Before World War II nothing had been over sixpence (2½p). Now some branded dolls were fifty-five shillings (£2.55). Even accounting for inflation this was twenty-five times higher. At today's prices the most expensive doll would be £45 or $56. But sixpence still bought a three minute go on the sit-and-ride horse in the background ! The picture above shows Atherstone, Warwickshire in 1973, just before it was modernised. It had first opened in 1935 and appeared to be trapped in a time warp. When it had first been fitted out the company had not stocked large items. As the range had expanded it had simply squeezed them in, creating ramshackle displays with echoes of the original US Woolworth 5 & 10¢ in Utica, New York in 1879! The 'after' picture shows rge scake of the makeover. Between 1969 and 1975 200 stores were upgraded each year, finally moving to self-service as a way to avoid the cost of decimalising twenty thousand cash registers, after the change of currency in 1971. One-by-one the older stores closed for a week. The counters were dismantled, taken to the stockroom for cleaning while the walls and ceiling were repainted. Their wooden floors were scrubbed and then fiited with thermoplastic tiles, some plain and some patterned. 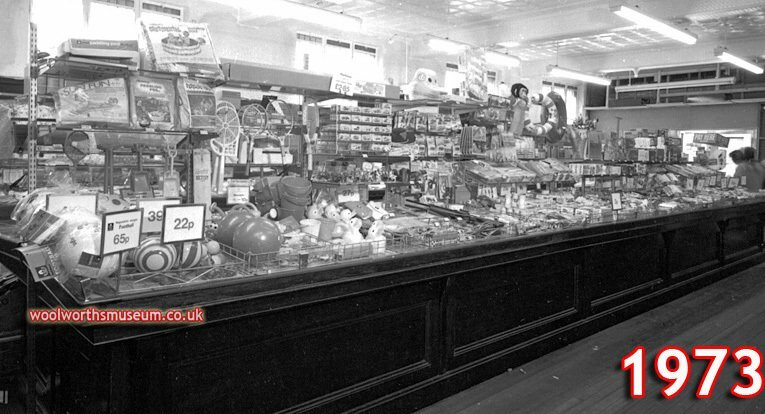 The old counters were then re-assembled in taller configurations at the back of the store, and new ones were installed at the front along with new cash and wrap desks to take customers' money. The last stores got their 'every expense spared' makeovers in 1975. 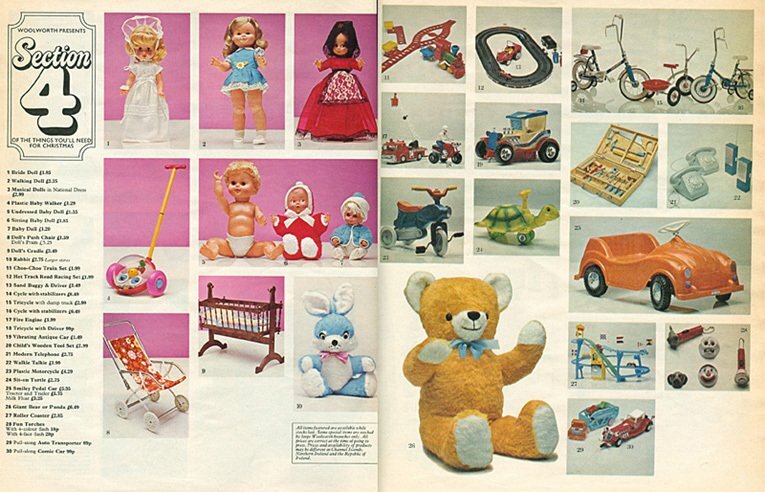 To give a flavour of the toys that children chose in the 1970s, we've picked out some typical pages from the Christmas Catalogues of 1973 and 1975. The brochures were a new idea, reflecting changing buying patterns. If you have a broadband connection you can download a high resolution PDF of the extracts shown below. 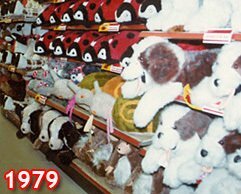 By the late 1970s Toys had begun to play a more important part in the overall Woolworth's offer. 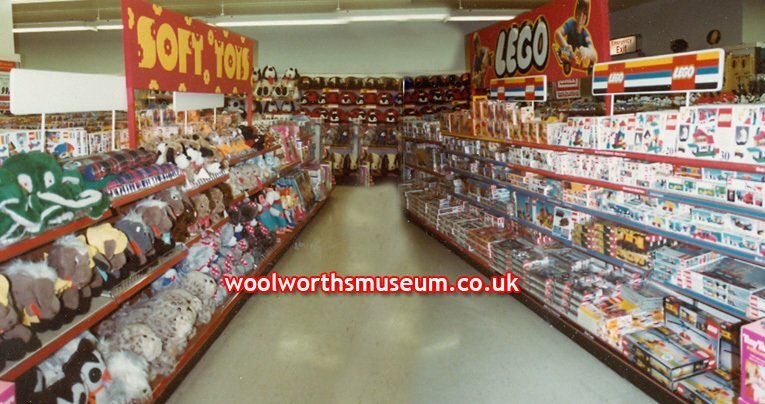 The largest stores had enough space to offer more toys than specialist Toy shops, allowing them to experiment. The flagship Oxford Street store in London W1 allocated a sixty foot (18m) run of counter to Lego. 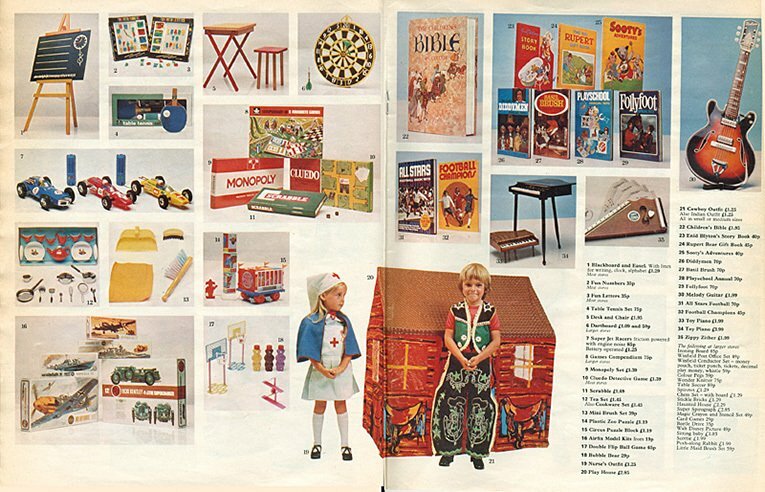 There were similar-sized displays of soft toys, Fisher-Price pre-school, sports and leisure, and camping. The toy counters of the flagship store in London's Oxford Street were over 250 feet (80m) long! They tempted tourists to buy soft toys as gifts. The top sellers included British bulldogs, ladybirds, penguins, snails and a cuddly octopus. In the late 1970s there was a craze for radio-controlled and electronic toys. In 1977 the first lines sold out quickly. In 1978 Woolworth broadened its range and promoted it strongly on TV. In 1979 electronic gadgets featured strongly in the Christmas campaign. 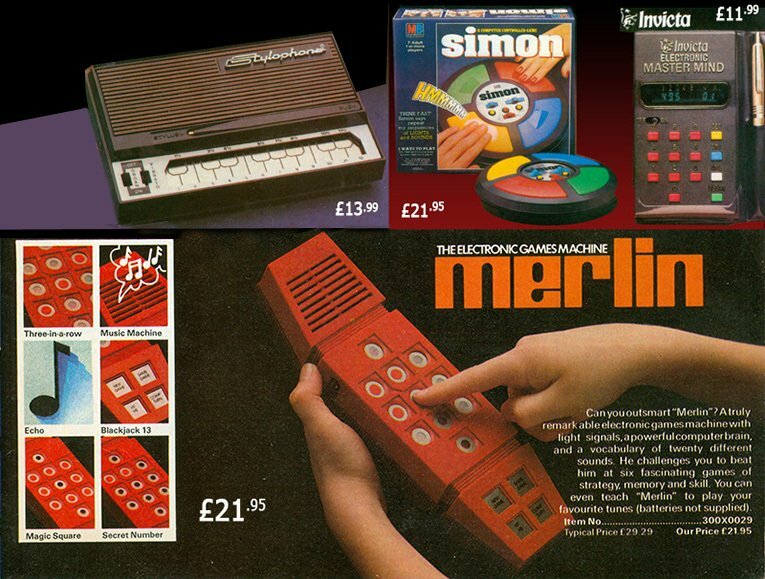 Two lines, Kenny Everitt's Captain Kremen Krenometer and a Stylophone, won out, along with an electronic game called 'Merlin' (below). The ads also featured Milton Bradley's Simon. Invicta promoted its Electronic Mastermind, while MB pushed its Computer Battleships and Logic 5 on TV. The modern age was dawning and Woolworth wanted its share. You can find out more in our Eighties toys feature.